The raw materials used in ceramics manufacture are of a mineral nature and their main component is clay. Depending on the technical characteristics of the product to be made, the different compositional ingredients are mixed and milled until they are completely homogenised and have the optimum particle size to provide the appropriate plasticity for forming. Various raw materials are used in preparing ceramic bodies and, depending on the behaviour of these materials on dispersion in water, they are divided into plastic or fat materials and non-plastic or lean materials. Fat materials are the ceramic raw materials par excellence, consisting basically of clays and kaolins. Lean materials are substances that are incorporated into the body formulation with a view to reducing plasticity, controlling product quality, or adding specific properties. The most frequent lean materials are silica sands, alkaline feldspars, calcium carbonates, talcs, zirconium silicates, and colorants. Clay. A universal component used in preparing ceramics owing to its extraordinary ease of transformation through mouldingand hardening processes. Although there are numerous classifications, the most common classification in the manufacture of ceramic coverings is based on the colour of the body-red or white-. Red-body clays are characterised by their high iron content, low melting temperature, and moderate plasticity, whereas white-body clays are more plastic and have no colouring oxides. Kaolín. Very pure white clay used in preparing porcelain, as it keeps its colour during the firing process. It is more difficult to press and requires a higher firing temperature. Silica sand. Ingredient that reduces shrinkage of the pieces in the kiln and increases their porosity once they have been fired. Excess silica sand reduces the mechanical strength and raises the coefficient of expansion of the end product. Alkaline feldspar. Ingredient that acts as a fluxing element at high temperature, facilitating the reactivity of the mixture by lowering the firing temperature needed to reach a given apparent porosity. Calcium carbonate. Ingredient that provides high strength before reaching the melting temperature by reducing the risk of liquefaction. It also increases the porosity and water absorptionof the end product, while contributing to greater dimensional stability. Talc. Ingredient that increases the expansion coefficient and decreases the moisture expansion of the fired product in earthenware tile manufacture, while it increases fusibility in white-body stoneware floor tile compositions. Colorants. Pigments obtained by calcining natural oxides, used for colouring the ceramic body. 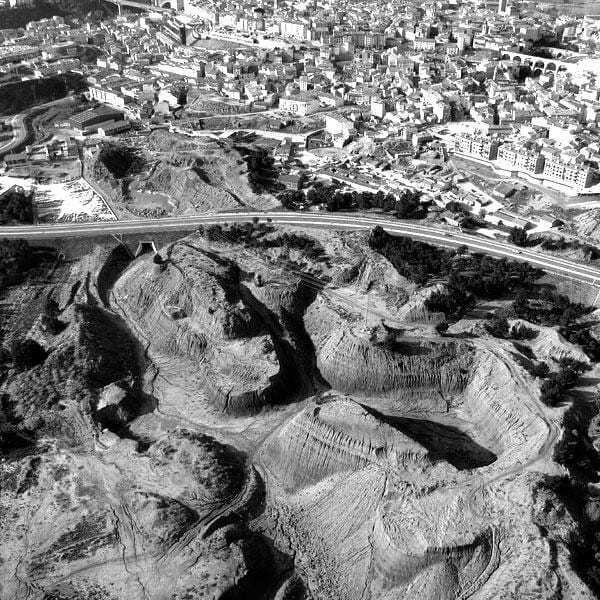 Aerial view of clay quarries in Teruel, Spain. 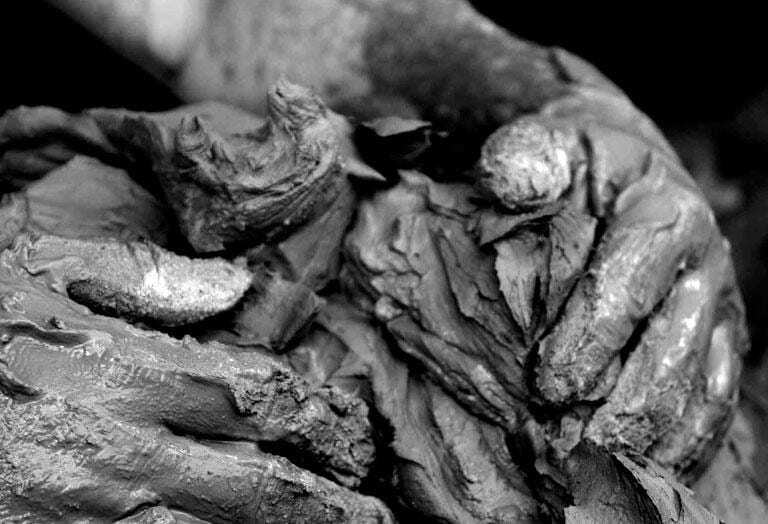 Manual wet-mixing process of the clay body. This is the raw materials grinding process that serves to obtain a homogeneous mixture for appropriate moulding of the piece. Particle size is an important factor, as it significantly influences the plasticity of the mass, the forming process, drying speed of the piece, and many physico-chemical properties of the finished product,such as colour, porosity, or mechanical strength. Two types of milling are used in the ceramic industry: wet milling and dry milling. This is the process by which raw materials are ground in water. Wet milling takes place in ball mills into which the solids, water, and deflocculating additives that facilitate milling are introduced. The resulting product is known as a slurry or slip, and the particle size in the suspension varies according to milling time, and mill length and rotating speed. The slurryis subjected to spray drying in a flow of hot air that causes the water to evaporate and the particles to dry by convection and heat radiation mechanisms, yielding hollow spherical particle agglomerates with a very low moisture content and suitable size for the forming stage. A special case in the wet milling process is the deflocculated slurry. This is anoptimum emulsion of clay body particles in dispersion for slip-casting processes. This is the raw materials grinding process without water. Dry milling takes place in hammer millsor in pendulum mills, which produce smaller-sized particles and are equipped with a heating system that facilitates the milling of wet clays and allows the desired particle size to be obtained. These components are frequently used when the technical and dimensional requirements of the ceramic covering are not so demanding, owing to the lower production cost compared with that of the wet milling system. Forming is the process by which the raw materials selected for ceramic tile manufacture are moulded. Once the mixture has been homogenised and provided with optimum moisture conditions, the product is formed and subjected to a natural or mechanical drying process that assures appropriate development of the firing and glazing stages. The ceramic industry for construction uses the following types of forming: manual, dry pressing, plastic pressing, extrusion, and slip casting. This is the moulding system in which forming takes place directly by hand, enabling a surface finish to be obtained that bears the signs of the craftsman. It requires a mixture of raw materials that are usually dry milled, with a plastic consistency and clayey base. This is spread directly on a mould with the desired shape and size and left to dry in the open air before it is put into the firing kiln, giving rise to a porous and heterogeneous ceramic material. Hand moulding of fired clay tiles. This is the moulding system used in making thin flat pieces with a regular geometry. It is the most-widespread procedure used in the manufacture of earthenware tile, glazed stoneware tile, and porcelain tile. This forming process uses raw materials that are generally wet milled. The use of spray-dried slurry provides multiple advantages,owing to the shorter drying time of the pieces and to the minimum deformation they undergo during firing. This type of forming accounts for the greatest percentage of current manufacture, because it allows very high production volumes to be achieved that require a high degree of automation in all the process stages. Dry pressing of porcelain tiles. This system is used in moulding ceramic products with faces that display different shapes. Although its use is not widespread and it only accounts for a small percentage of total production, it is frequently used in fabricating individual pieces. This forming process uses dry milled raw materials with a high moisture content, giving rise to a body with a plastic consistency that is formed in a porous plaster mould. The mould consists of two pieces, corresponding to the top and bottom of the ceramic product. The product is demoulded by injecting pressurised air through the pores of the mould. Plastic pressing of glazed stoneware pieces. AZPML (FOA), Spanish Pavilion EXPO 2005, Aichi, Japan (2005). 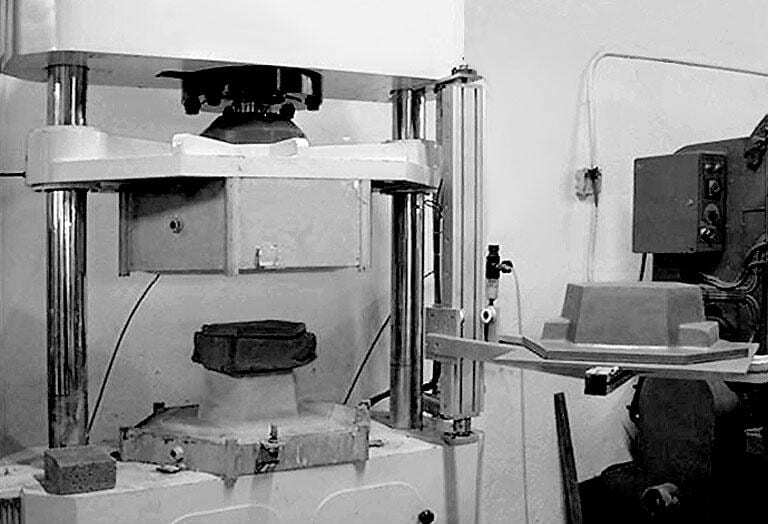 This moulding system is used to make flat ceramic products with a constant profile, such as thin flat slabs of fired clay known as baldosín catalán and rustic stoneware tile, or longitudinal elements with a complex cross-sectional volume, such as those used in solar protections and screens. It is commonly used both in fabricating conventional pieces and in making singular pieces. This forming process uses dry milled raw materials to which water is added to provide appropriate plasticity for extrusion. In extrusion, the ceramic body is pushed through a die with the desired cross-section. 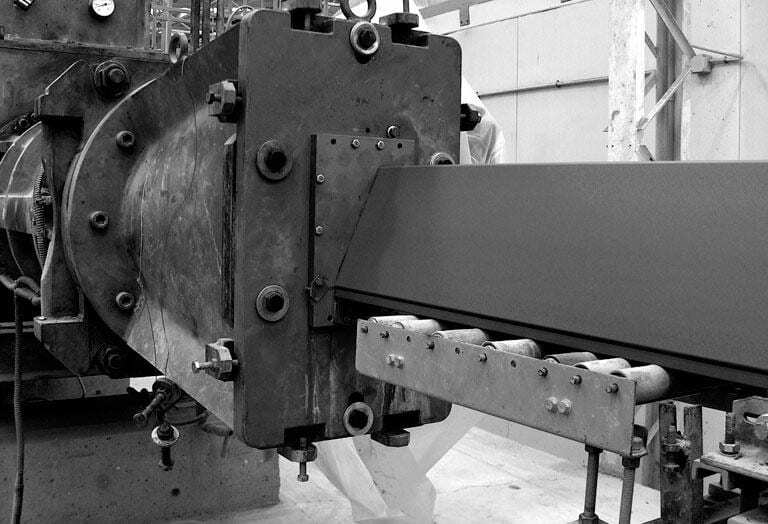 The extruded column is then cut or embossed to obtain the desired size and definitive shape of the piece. Extrusion of glazed stoneware pieces. Rafael Moneo, Aragonia Complex, Zaragoza, Spain (2010). This is the appropriate moulding system for the production of items with complex shapes, and it is the technique used in manufacturing vitreous china sanitary ware. Its application in the field of architecture is very limited and it is used in making singular pieces. This forming process requires wet milled raw materials in order to prepare a deflocculated slurry characterised by a high degree of flowability. This emulsion is poured on a porous gypsum mould that absorbs a certain quantity ofwater, generating a solid clay layer of variable thickness, depending on slurry density, contact time, and characteristics of the mould. Slip casting of the deflocculated slurry in the mould. Surface treatments are performed to add new physico-chemical or ornamental properties to the ceramic pieces. They can take place in different stages of the process, and the resulting surfaces are divided into: natural, textured, glazed, or decorated. This is characterised by the absence of any type of surface treatment. 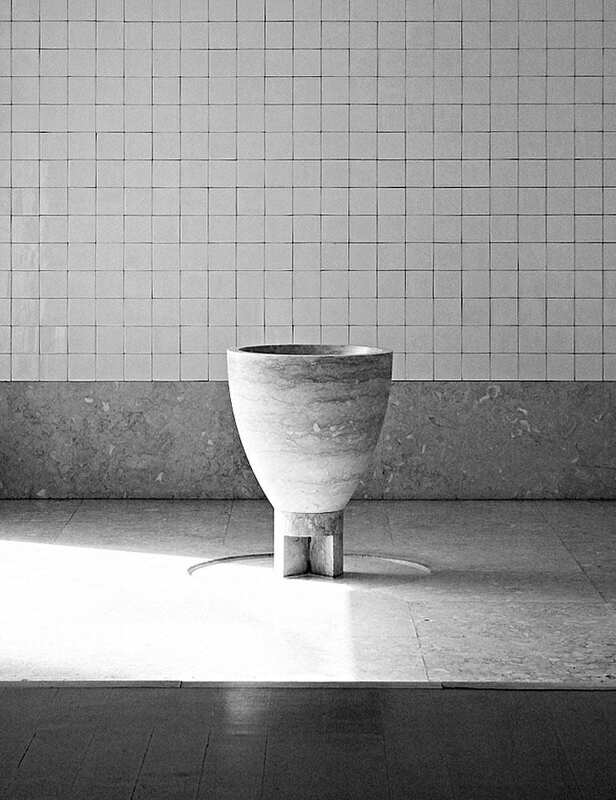 The qualities of the piece and its proper surface are determined by the raw materials composition making up the ceramic body, which is only processed by forming and firing to obtain the technical and formal properties of each product. 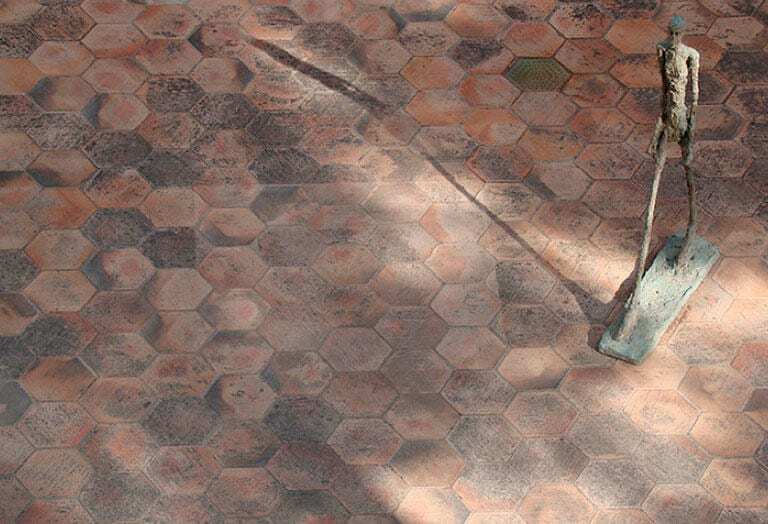 This finish is frequently found in fired clay tile, baldosín catalán, porcelain tile, and rustic stoneware tile. Outdoor fired clay flooring with a natural finish. 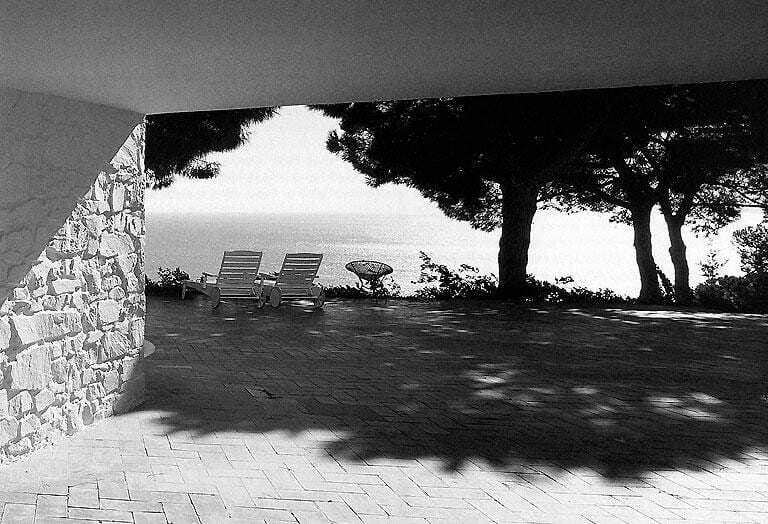 Josep Lluís Sert, Maeght Foundation, Saint-Paul-de-Vence, France (1964). This process is used to modify the surface structure geometry of the ceramic product. Texturing can be performed in the forming stage or in post-production, once the piece has been made. Depending on the technique used, different textures are obtained, involving either a rough or a polished finish. Rough. This process takes place in the forming stage and consists of introducing the profile or embossing in the outer surface of the product. The treatment may be applied to improve the product’s technical qualities, such as slip resistance, or for exclusively ornamental purposes. Polished. This takes place in the post-production stage and it consists of polishing the surface of the piece by mechanical abrasion methods, obtaining a greater colour intensity and a high degreeof uniformity. The technique is mainly applied in porcelain tiles. External detail of the terracotta relief on façade. Auguste Perret, Rue Franklin dwellings, Paris, France (1903). This process consists of applying a thin glaze layer that adheres to the surface of the piece by a fusion process, generating a protective, impervious coating that adds new technical and ornamental properties, such as slip resistance, chemical resistance, and mechanical strength, as well as gloss or colour. The raw materials used may be wet milled, yielding a slip resembling the suspension used in preparing the ceramic body, though it contains particles with a smaller size and a larger quantity of water. They may also be dry milled and dispersed in water, or applied dry for special effects. There is a great variety of glazes, which are adapted to different bodies and firing temperatures. At present, glazes may also be found with self-cleaning or biocidal properties, these being the result of the ongoing technological innovation in the ceramic industrial sector. 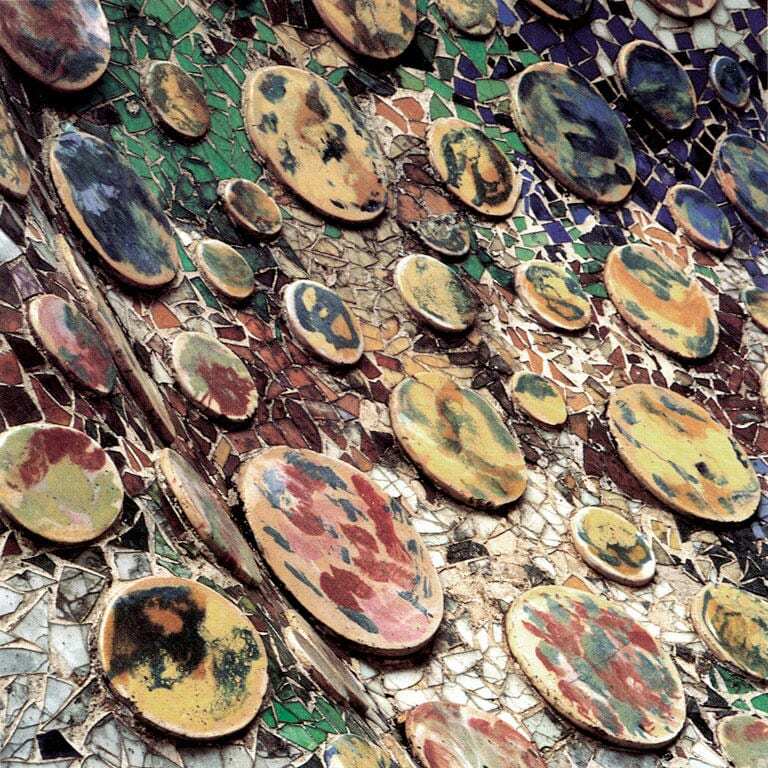 Glaze compositions are mostly made up of frits, unfritted raw materials, additives and ceramic colorants. These ingredients are variously combined, depending on the targeted product. Frits. Inorganic chemical substances obtained by fast cooling (quenching) a complex combination of materials that look like broken glass. The use of frits reduces the toxicity of the process, widens the firing range, and provides a more uniform finish. Unfritted raw materials. Substances that contain the different types of oxides responsible for providing the glaze composition with the desired characteristics. Additives. Substances that, added to the raw materials, improve certain technical qualities. Particularly to be noted among the various types are the suspending agents, deflocculants, and binders. Colorants. Substances that, added to the raw materials, modify the colour qualities and provide the glazed surfaces with their definitive appearance. To perform the vitrification process on the surface of the ceramic piece, an engobe layer needs to be applied beforehand, which acts as a bond between the body and the glaze, assuring proper anchoring between both. The engobe eliminates external irregularities and hides the colour of the substrate, providing a uniform surface and creating an impervious layer to prevent problems of porosity. The glaze is applied on the engobe layer in the form of an aqueous suspension, all its properties being acquired once the firing has ended, yielding a consistent, compact coating with a uniform thickness known as a consolidated layer. There are different application methods: manual, dry application, spraying, and continuous curtain application, the last two being the most widespread in the ceramic industry. Manual. This is done using manual techniques such as pouring or dipping, or using different utensils, and it is performed by a craftsman or an artist. Dry application. This is performed with devices that proportion dry-ground frit particles of different sizes, or products obtained by granulation or thermal softening of the glazes. Spraying. This is performed using a spinning disc that deposits small drops on the surface of the piece, forming a continuous thin layer with a rough finish. Continuous curtain. A glazing bell is used. The slip flows down over the outer surface of the bell as a continuous waterfall,coating the ceramic body with a glaze layer of greater thickness and smooth texture. External glazed stoneware tile cladding on roof. 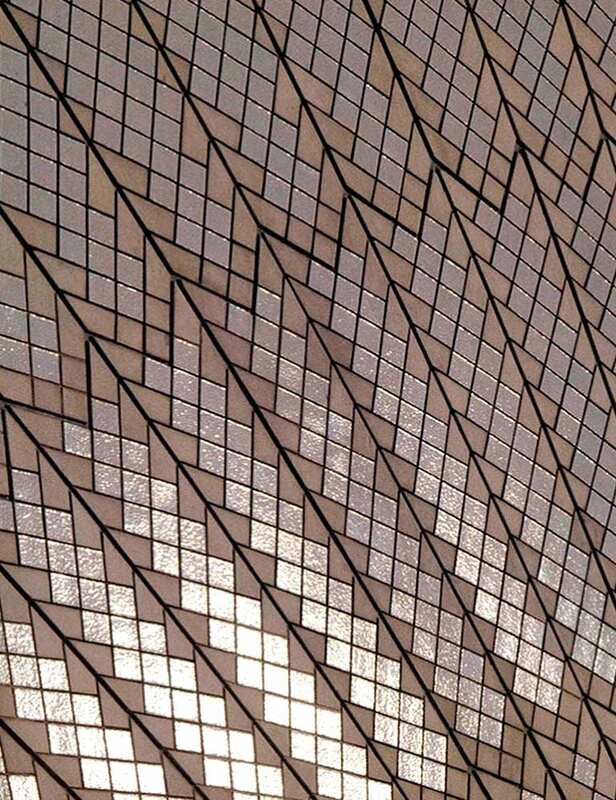 Jorn Utzon, Sydney Opera House, Australia (1973). Prefabricated glazed stoneware tile panel on façade. RPBW, Central St. Giles, London, United Kingdom (2010). This has an ornamental purpose and can be carried out in different manufacturing process stages. 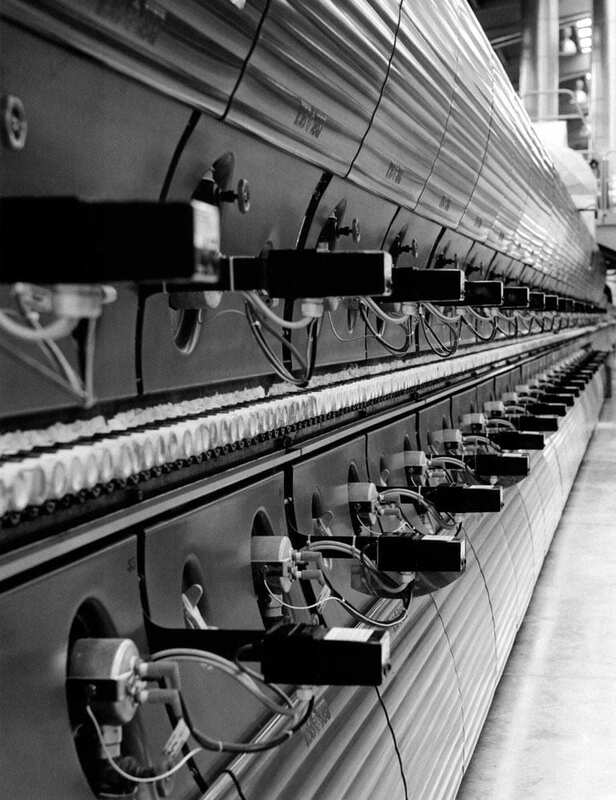 The application takes place in the glazing line, though certain techniques are used in post-firing stages, such as physical vapour deposition (PVD) or laser printing. 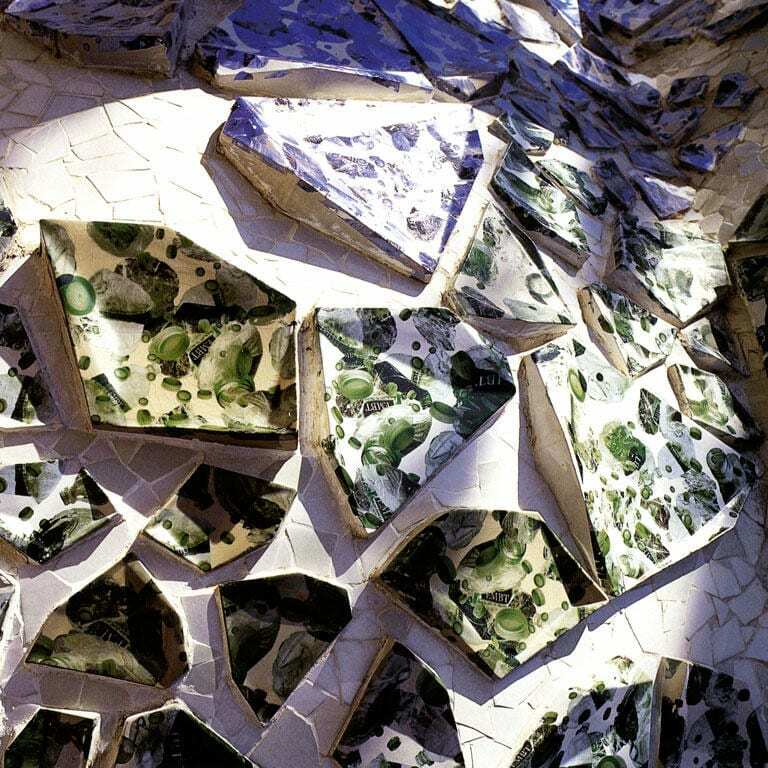 Throughout history, the different decoration methods have sought to mechanise the application of a pattern or design on the ceramic surface with a view to optimising production. However, recent years have witnessed important technical developments, involving the appearance of new systems that allow complex surface treatments to be created with great precisionand speed. Manual. Technique in which the glaze is applied by hand on the ceramic body using different utensils. This method generates unique, exclusive, singular pieces as a result of the application by hand, offering an alternative to the products obtained in standard industrial processes. Manual decoration has been used in all cultures and is a legacy of antiquity. Dry chord. 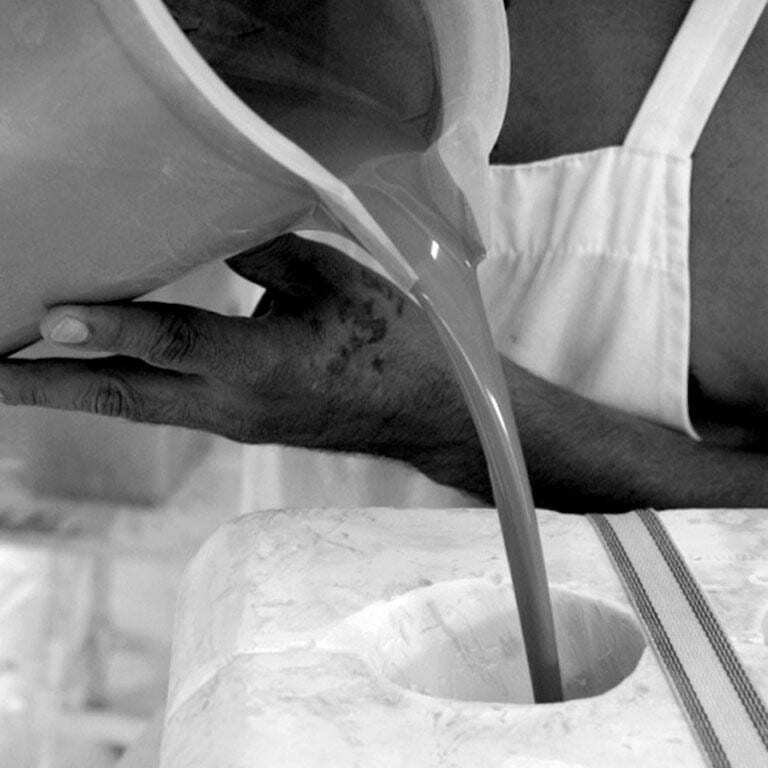 Technique consisting of the application of a mixture of metal oxides on the body of the piece to create a separating barrier that keeps the different ceramic glazes from mixing. The design is transferred to the body by a template, in which graphite is passed through a perforated paper displaying the design to be reproduced. 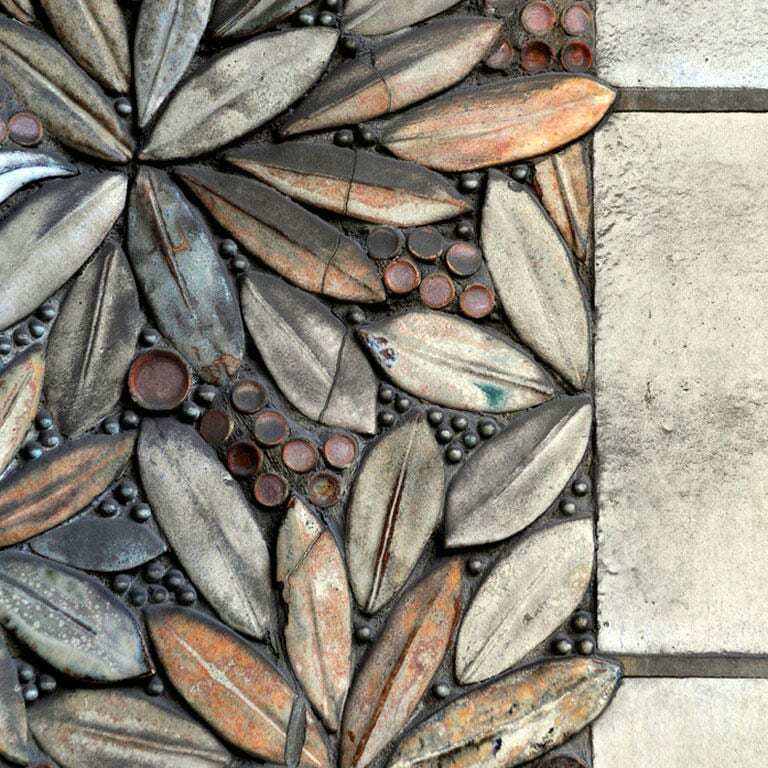 This decoration technique dates back to the 11th century and emerged as a simpler and cheaper alternative to the laborious wall tilings (alicatados) of the time, in which the tiling followed a geometric pattern made by grouping numerous glazed pieces cut with pliers. Arris. 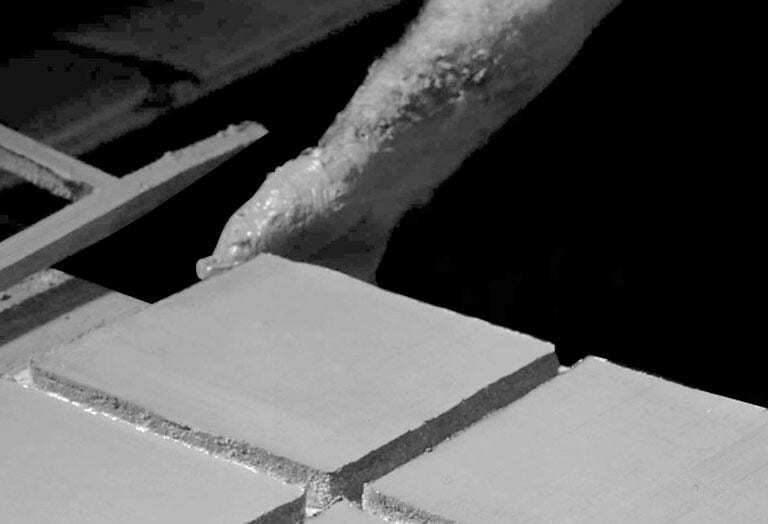 Technique consisting of the formation of small raised edges (arrises) on the piece with a view to keeping the surfaces to be glazed separate, and preventing them from mixing during the firing process. The decoration was transferred to the body using a mould made of wood, metal, or gypsum. When pressure was exerted on the wet body, the mould generated the divisions that kept the colours separate. It dates from the 15th century and involved a development of the dry chord technique, on attempting to eliminate the dark contours that kept the glazes separate and to allow faster, mechanical application of the design, though the results were less precise. Stencil. Technique in which water-based glazes are applied on the surface of the piece through templates known as stencils. Stencils were made of waterproof materials-waxed paper or plastic sheets- and the number of stencils used varied according to the characteristics of the model, requiring at least one stencil per colour. It was the most widely used method in the application of decorations from the mid 19th to the mid 20th century. Airbrushing. Technique in which ceramic glazes are sprayed on the piece by means of airbrushes that spray atomised pigments by pressurised air, enabling the entire surface to be covered or decorative effects to be produced. Although it provides excellent results, it is currently falling into disuse owing to the high air pollution caused by the scatterin the environment of the suspended glaze. Screen printing. Flat printing technique in which the ceramic glazes are applied on the piece through a fine mesh fabric stretched on a frame known as a screen printing screen. Areas in the screen fabric are blocked by means of a photosensitive solution, letting the colour pass through the openings to reproduce the design to be transferred and requiring at least one screen per colour. It involved a development of the stencil, as it is a mechanised process that allows complex decorative effects with a high degree of definition to be obtained. Flexography. Rotary printing technique in which the glaze is applied by means of a smooth roller on which a polymer sheet is fixed that bears the profile of the design to be reproduced. The decoration is transferred to the body by contact, produced by rotation of the sheet impregnated with the proportioned quantity of pigments. This technique, developed mainly during the 1990s, is still used at present, though its application is falling into disuse owing to replacement with the rotogravure method. Rotogravure. Rotary printing technique in which the glaze is applied by means of a roller that has been laser-engraved with the design to be reproduced. The decoration is transferred to the body by contact, produced by rotation of the roller impregnated with ink in the roller cavities. This was introduced into the ceramic sector in the first decade of the 21st century, and it is currently widely used. 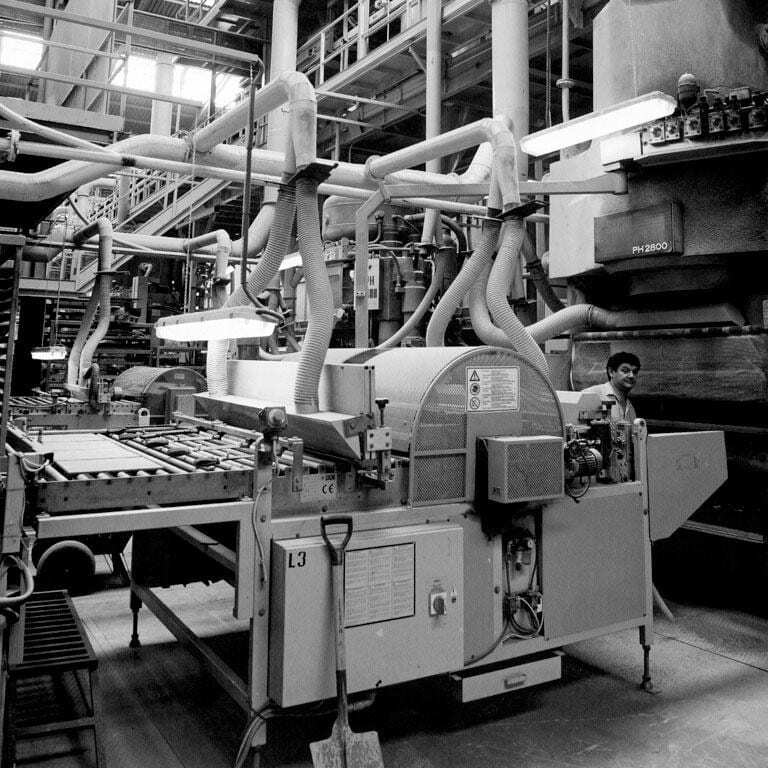 It involved a development of the flexography technique, as it allows different pieces to be made under the same design. Inkjet printing. Digital printing technique in which the glaze is sprayed on the body by means of injectors containing different inks,depending on the design to be obtained. The design is transferred to the body without any contact and the technique allows unlimited configurations to be realised because computer processes are used. Although it is widely used in other fields, this is the most innovative decorating technique and it is currently being implemented very quickly owing to its versatility. Antoni Gaudí, Batlló House, Barcelona, Spain (1877). 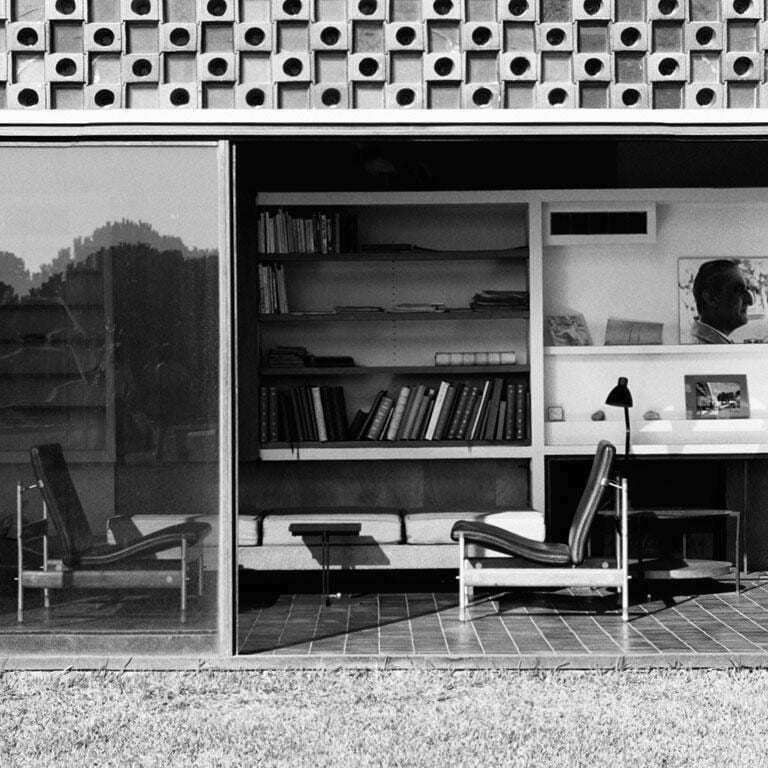 Gio Ponti, Parco dei Principi Hotel, Sorrento, Italy (1961). EMBT Arquitectes, Diagonal Mar Park, Barcelona, Spain (1997). 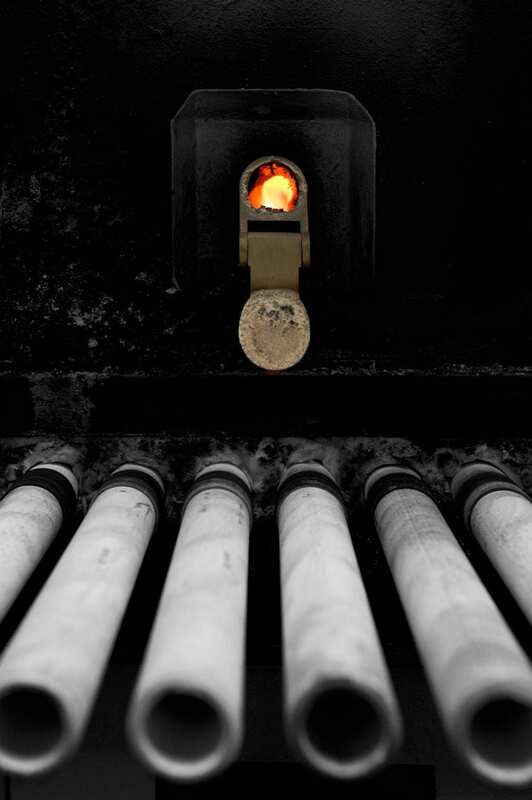 Firing is the most important manufacturing process stage because, when the semi-hardened elements travel through the kiln, they undergo fundamental transformations in their physico-chemical properties. The processed pieces are subjected to a high-temperature thermal cycle that varies as a function of the product to be obtained, giving rise to a hard, resistant material, with technical characteristics that determine its ceramic condition. The firing process is performed in different types of kilns and, depending on the characteristics of the product, the ceramic pieces are subjected to high temperatures in a range of 900 to 1300 ºC. The kilns have three different stages: loading, firing cycle, and unloading of the elements. Depending on how these stages are carried out, the kilns are divided into kilns with an intermittent cycle or a continuous cycle. Intermittent or periodic kilns are characterised by a break in the energy input after each firing cycle. The heating system stops and loses the heat accumulated during the process, which involves a necessary waiting time and lower productivity. This is customarily carried out in bell kilns, which consist of a working base on which the ceramic pieces are set and a moving structure that surrounds the elements during firing. Heating is performed by radiant tubes installed inside the walls or by direct fire in the base, in both cases achieving a high degree of temperature uniformity as a controlled atmosphere is involved. It is customarily used in manufacturing moderate production volumes, and it is suitable for firing large pieces. Continuous kilns are characterised by uninterrupted development of the firing cycle. The heat released by the pieces during the cooling stageis reused in the initial heating stage, leading to greater energy recovery and higher productivity. 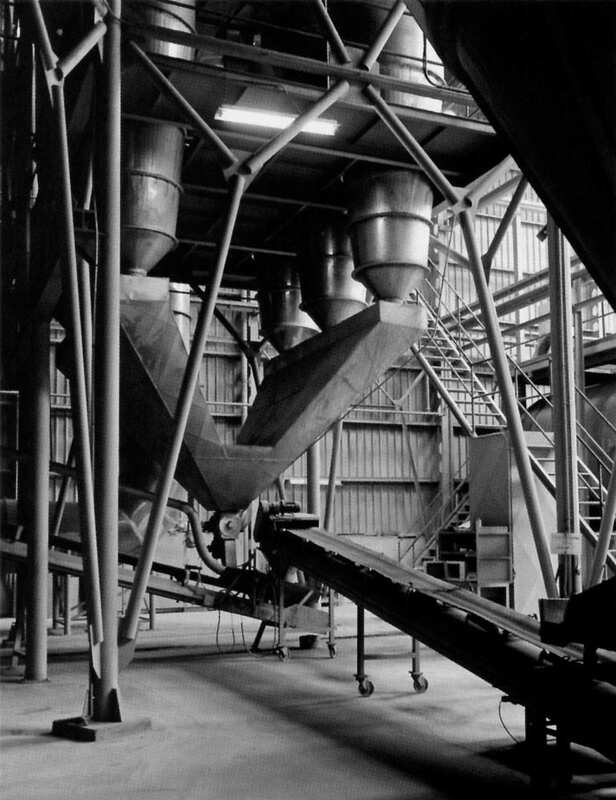 This customarily takes place in single-deck roller kilns, the deck consisting of a line of constantly moving rollers that allow the pieces to be continuously conveyed through the kiln, providing multiple advantages, such as greater heat recovery, shorter firing cycle, low energy consumption, and less air pollution. This completely automated process is suitable for very high production volumes, as a result of which its use has prevailed at present in the manufacture of flat ceramic coverings. External view of the installations of a single-deck roller kiln. The firing cycle consists of two different stages: heating and cooling. Heating is performed in two steps, known as initial heating and firing, with a view to drying the pieces and hardening them. Cooling, in which it is sought to accelerate the cooling of the fired product, takes place in three steps: forced cooling at high temperature, natural cooling, and forced cooling at low temperature. Initial heating. This consists of gradually raising the temperature to completely remove the moisture from the pieces and avoid the risk of breakage caused by fast expulsion of water, preventing the appearance of surface defects in the finished product. Firing. This consists of a high-temperature thermal cycle in which the raw materials are transformed into a single complex structure that provides the pieces with strength and hardness, giving them the technical characteristics that determine their ceramic condition. Forced cooling at high temperature. This takes place by forced convection and consists of impelling air at ambient temperature into the kiln, close to the pieces, shortening the firing cycle. Natural cooling. This takes place by natural convection and consists of reducing the temperature without any artificial means, with a view to obtaining gradual cooling that minimises any possible stresses caused by volume changes. Forced cooling at low temperature. This takes place by forced convection and consists of impelling air so that the pieces can be handled once they have acquired thermal shock resistance. Single firing. The element is fired once. This is the most widely used system as it involves important savings in time and energy. When glazes and decorations are applied, this must be done on the unfired body. Double firing. The element is fired twice: the first firing serves to obtain the ceramic biscuit, while the second firing is performed after the glaze application. Third fire. Three firings of the element are performed, the third firing being for special decorations on the already fired glazed body. A fourth firing may be performed on pieces that require very complex ornamentations. Partial view of the heating stage during the firing cycle. There is a great variety of ceramic products for vertical and horizontal surface coverings. Based on the technical characteristics of the material, the ceramic industrial sector uses the following classification: fired clay tile, earthenware tile, baldosín catalán, glazed stoneware tile, porcelain tile, and rustic stoneware tile. These designations are customarily used for flat products, though special pieces or trims may also be found – generally with a certain volume – such as the auxiliary pieces devised to solve specific problems, or singular pieces with their own characteristics and functions, which require exclusive fabrication. Name given to ceramic products formed by manual methods, generally unglazed, with high water absorption (6-15%) and medium breaking load (2300-3200 N). The body has an earthen colour and exhibits a very irregular texture, on both the surface and the edges. The hand moulding allows a wide variety of sizes(≤ 0.25 m2/piece), more than 10 mm thick. They are customarily used in flooring, but are not recommended in outdoor installation in frost zones owing to their high water absorption, nor in areas with heavy traffic, as they do not have high mechanical strength. Installation takes place in thick-bed mortar and does not need an excessively regular fixing background. Certain additional treatments can be applied on the proper surfaceof the piece for functional reasons, such as impermeability, or for formal reasons, in order to enhance its appearance. Lattice composed of pieces of fired clay. Marcel Breuer, Hunter College, New York, USA (1960). Traditional name for dry-pressed, glazed ceramic tiles, with high water absorption (11-15%) and low breaking load (300-1200 N). They may have a red body or a white body, displaying a fine, uniform surface with regular, well-finished edges. Small sizes (≤ 0.10 m2/piece) predominate, in square and rectangular shapes, less than 10 mm thick. They are most widely used in vertical facings, as they exhibit optimum conditions for cleaning and protection against water, though they are not recommended for use in outdoor installation in frost zones, or in floors owing to their lack of slip resistance and low mechanical strength. Installation takes place in thick-bed mortar and does not need an excessively regular fixing background. Although they are currently being replaced with ceramic materials that display enhanced performance features, earthenware tiles have accounted for a very important percentage of industrial production because they offer an extraordinary range of sizes, colours, and decorations. External earthenware cladding designed by Athos Bulcão. Oscar Niemeyer, Mondadori Editorial Headquarter, Milan, Italy (1971). Traditional name for extruded, unglazed ceramic tiles, with medium-high water absorption (4-12%) and low breaking load (500-1800 N). The body is red and exhibits a heterogeneous texture in which certain imperfections can frequently be observed. Small sizes predominate (≤ 0.10 m2/piece), with square and rectangular shapes, less than 8 mm thick. These tiles are basically used in outdoor surface coverings, such as terrace flooring and flat roofs in zones with little frost risk. Installation takes place in thick-bed mortar and does not need an excessively regular fixing background. Certain additional treatments can be applied on the proper surface of the piece for functional reasons, such as impermeability, or for formal reasons, in order to enhance its appearance. Manufacture has been mainly concentrated in Catalonia -hence the name- but production and consumption are currently clearly diminishing. 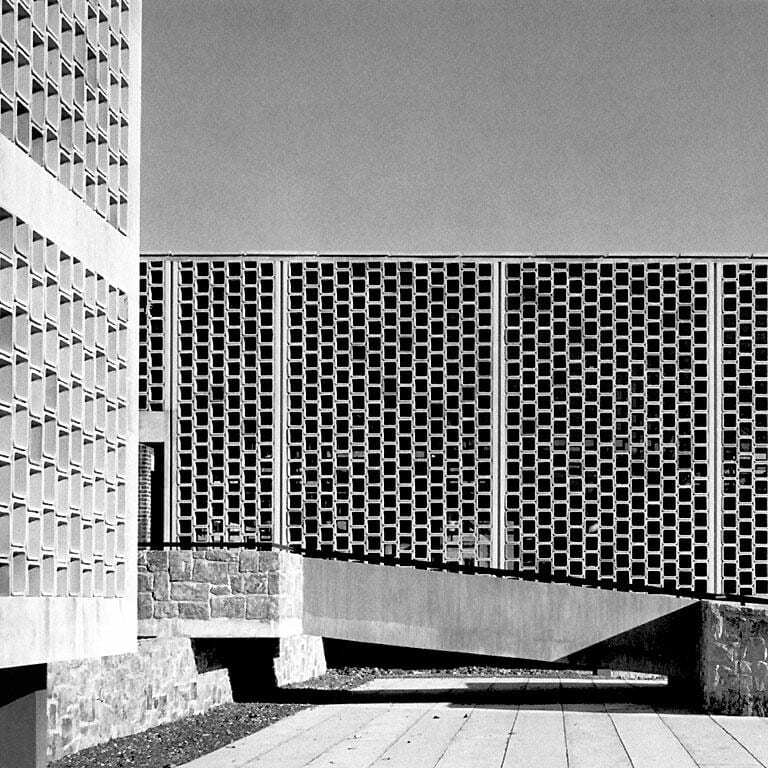 José Antonio Coderch, Ugalde House, Caldas de Estrac, Spain (1952). This is the usual name for dry-pressed, glazed ceramic tiles, with medium-low water absorption (2-6%) and low breaking load (300-1200 N). They have a white or red body and exhibit a fine, uniform surface with regular, well-finished edges. Medium sizes (0.10-0.25 m2/piece) predominate, with square and rectangular shapes, less than10 mm thick. They are generally used as vertical as well as horizontal interior coverings, and when they have appropriate characteristics with relation to frost or abrasion, they can be used in façade cladding and exterior flooring. Installation takes place in thin-bed adhesives that need a flat, regular fixing background. 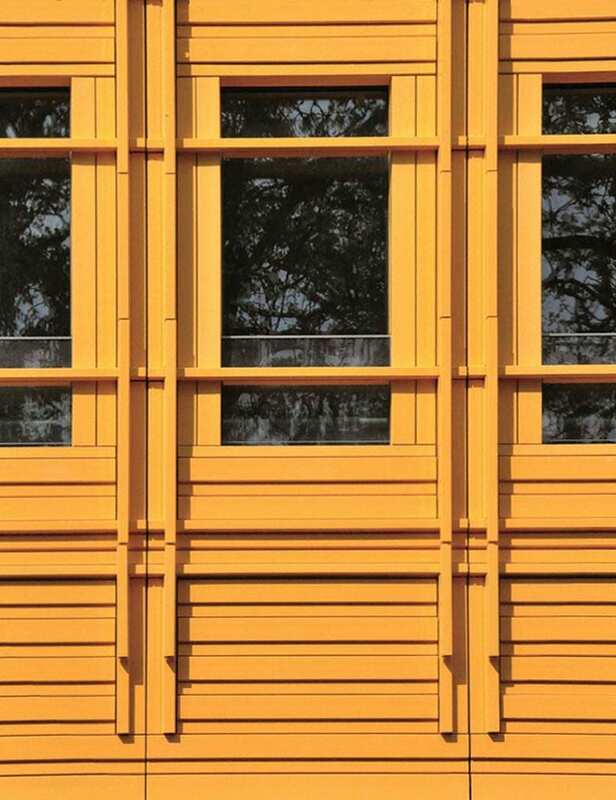 There is an extraordinary range of products, owing to the multiple possibilities of colours and decorations offered by the glazing of the proper surface, and they account for an important percentage of industrial ceramic production. Interior glazed stoneware tile cladding. Álvaro Siza, Santa María Church, Marco de Canaveses, Portugal (1996). Usual name for dry-pressed or extruded, glazed or unglazed ceramic tiles, with extremely low water absorption (≤ 0.5%) and high breaking load (1800-5200 N). In the case of unglazed porcelain tile -also designated technical or compact porcelain stoneware- the body consists of a homogeneous mass that determines the proper surfaceof the body, unlike glazed porcelain tile, which introduces additional decorations on the outer surface of the piece. Both types exhibit a fine, uniform texture with regular, well-finished edges. Medium and large sizes (≤ 1 m2/piece) predominate, with square and rectangular shapes, more than 8 mm thick, though high-tech ceramic laminates have recently been developed, measuring 3600×1200 mm, which are 3 mm thick. They are used in both interiorsand exteriors, in vertical and horizontal surface coverings, owing to their great technical performance features, making porcelain tile a recommendable material for any type of use, particularly in cross-ventilated façades as a result of its high mechanical strength. Installation takes place in thin-bed adhesives that need a flat, regular fixing background. In the case of cross-ventilated façades, this is performed by means of an auxiliary structure with mechanical fasteners. A latest-generation material is involved that has prevailed owing to its extraordinary technical characteristics and the great variety of post-production processes that can be performed, such as polishing, edge-grinding or rectification, and water jet cutting. Interior porcelain tile flooring post-produced by water jet cutting. 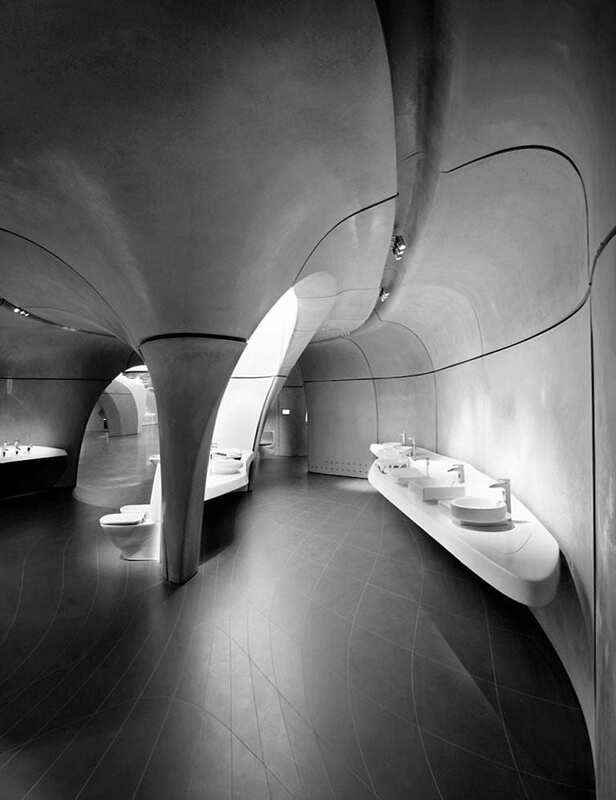 Zaha Hadid Architects, Roca Gallery, London, United Kingdom (2011). 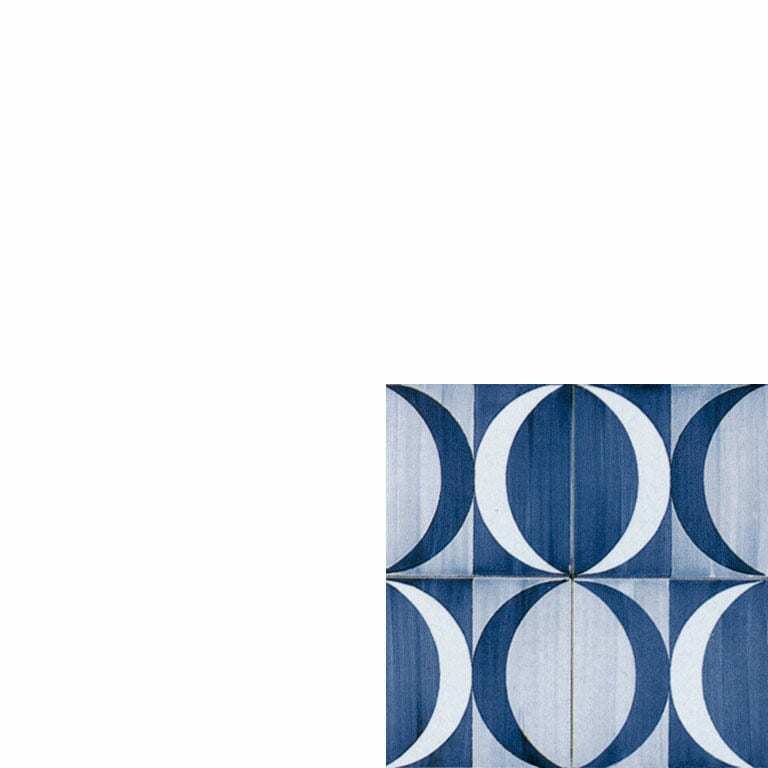 Quarry tiles. Characterised by low-pressure moulding of the pieces after the extrusion and cutting process, providing them with greater regularity and incorporating the possibility of recording technical information. Spaltplatten. Characterised by moulding the pieces by simultaneous extrusion of two elements joined by flutings on the back. After firing, they are separated by a dry tap. Small and medium sizes(≤ 0.25 m2/piece) predominate, with square and rectangular shapes, usually more than 10 mm thick. They are used in both interiors and exteriors, invertical and horizontal surface coverings, owing to their great technical performance features, making it a recommendable material for any type of use. Installation takes place in thin-bed adhesives that need a flat, regular fixing background. Certain additional treatments may be applied. One of the most characteristic is salt stoneware, in which common salt is sprinkled on the proper surface of the piece during the firing process, providing the piece with a characteristic heterogeneous coppery gloss. Rustic stoneware tile latticework and interior flooring. 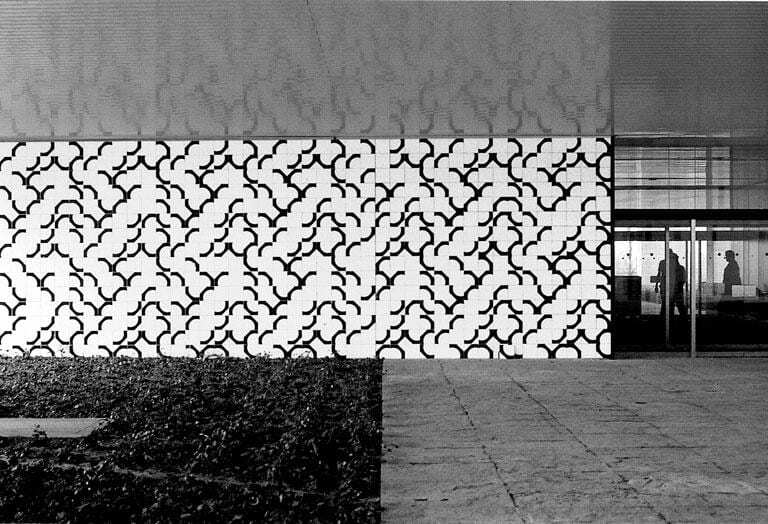 Antoni Bonet, La Ricarda, El Prat de Llobregat, Spain (1963). The soft origin of ceramics, hardened in subsequent processes, provides it with all the possibilities for technical and formal handling. This singularity facilitates the realisation of trims or auxiliary pieces to solve specific problems, and it make them suitable materials for fabricating singular pieces with their own characteristics and functions, which require exclusive fabrication. Auxiliary pieces adopt particular geometrics, generally with a certain volume, and they are made as trims for continuous tilings in order to solve specific functional aspects, such as the formation of corners, skirtings, non-slip steps, etc., or for ornamental reasons, such as mouldings, borders, or listels, there being a great variety of models on the market. The design of new ceramic products and singular systems, taking into account the technological advances and the industrial processes of the moment, stems from the response to the new demands of architecture. The realisation of these innovative materials requires close cooperation between industrial stakeholders and technical specifications writers, as these materials address particular characteristics and specific functions that often make it necessary to completely reformulate their manufacture. Recent years have witnessed an important increase in projects in which singular pieces have been used, obtaining results with an extraordinary technical and formal quality. Although their use is still infrequent and account for a very small percentage of total production, at present we find ourselves before an industrial sector that is able to respond with quality and efficiency to whatever challenge arises, demonstrating the potentially boundless field of application of these materials. Special porcelain pieces used for pillar cladding. 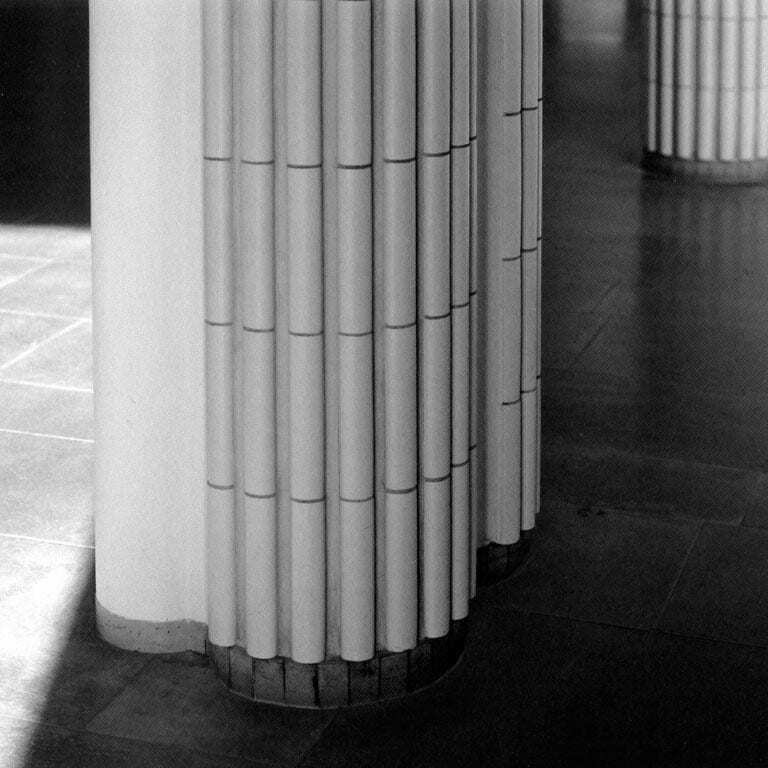 Alvar Aalto, University of Technology, Helsinki, Finland (1969).